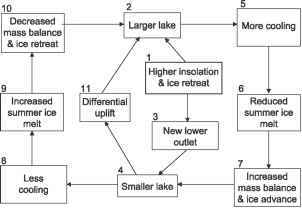 Figure 28.8 Schematic diagrams of oscillations of Lake Agassiz area, level and outflow routings as a result of ice retreat, climatic feed-backs and differential rebound. In these diagrams, the external forcing of relatively high summer insolation which drove general ice retreat (Kutzbach et al., 1998) is represented in box 1 with the heavy border. (a) Lake-atmosphere-ice interactions suggest decreased precipitation over the adjacent ice sheet as the lake enlarges, based on numerical modelling by Hostetler et al. (2000). This model accounts for ice retreat and the first opening of eastern outlets following early growth of Lake Agassiz. 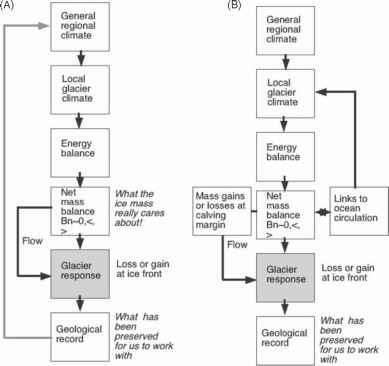 (b) Following concepts in Teller (1987), a large proglacial lake possibly provided more moisture and nourished growth of the adjacent ice sheet. See text for further explanation. (c) Possible feed-backs and effects using the modelling results of Krinner et al. (2004) for Eurasian glacial lakes. Large lakes induced cool climate that suppressed summer ice melting, and thereby enhanced growth of the adjacent ice sheet. Positive feed-backs to lake enlargement as in Figs 28.8B and 28.8C may account for ice read-vances such as the Marquette Advance (Fig. 28.5c) which closed the eastern outlet about 10ka (11,400cal.yr). northern North Atlantic seas between Greenland and Norway, and off Labrador, it imparts enormous quantities of heat to the atmosphere and gains density by further evaporation and cooling. This heat warms the climate of Europe and the North Atlantic basin. The cooled salty surface water, too dense to be buoyed up by underlying water masses, sinks to great depth and forms North Atlantic Deep Water (NADW). This deep water circulates southward and eastward, forming a Great Conveyor Belt of THC circulation, merging with Antarctic deep water masses in the southern ocean, and ultimately entering the Indian and Pacific Oceans. This Great Conveyor Belt is an important planetary mechanism for distributing heat to northern Atlantic regions and salinity to other oceans (Broecker, 1987, 1997; Clark et al., 2002b; Rahmstorf, 2002). Rahmstorf, 2002). Thermohaline circulation and atmospheric warming may increase elsewhere, for example in Antarctic seas, when NADW formation is reduced (Broecker, 1998; Rahmstorf, 2002). Thermohaline circulation and the rate of NADW formation is non-linear with respect to freshwater input and reduction of surface salinity (Broecker et al., 1985; Stocker & Wright, 1991; Manabe & Stouffer, 1995; Rahmstorf, 1995a,b; Rind et al., 2001a). At higher salinity, THC is vigorous, but below a 'threshold' salinity value, THC is sluggish. In between these two states, THC is very sensitive to changes in surface salinity and may shift from high to low rates of NADW formation (or vice versa) with a relatively low freshwater forcing, as shown and described in Fig. 28.9. This may help explain why the relatively small outburst of Lake Agassiz overflow around 11ka (13,000 cal. yr) (9500 km3) could have initiated the Younger Dryas cooling (Broecker et al., 1988), whereas the introduction of >160,000 km3 of freshwater when Lake Agassiz completely drained appears to have had only a small impact on climate around 7.7ka (8200cal.yr) (Teller et al., 2002). During the Younger Dryas, the roughly 1000-yr long shift of baseline overflow from the 2 million km2 watershed of glacial Lake Agassiz, from the Gulf of Mexico to the North Atlantic, may have sustained the relatively small Agassiz perturbation to THC and the associated cooling (Teller et al., 2002). Numerical models simulating North Atlantic climatic and oceanographic processes generally confirm the sensitivity of THC to freshwater inputs as noted in Fig. 28.9, although there are differences in detail. The freshwater input required to affect THC has been explored by numerous experiments in numerical modelling, and some results are reviewed in Teller et al. (2002). These experiments have shown that different stable modes of THC are possible, and that various North Atlantic responses may occur for a range of modelled influxes that overlap with the reconstructed influxes shown here (e.g. Manabe & Stouffer, 1988, 1995, 1997; Stocker & Wright, 1991; Weaver & Hughes, 1994; Tziperman, 1997; Ganopolski & Rahmstorf, 2001; Rind et al., 2001a). For example, Manabe & Stouffer (1997) found a reduction of THC and a decline of sea-surface temperature of about 6°C in less than 100yr for an input of as little as 0.1 Sv. Larger freshwater additions generated more abrupt rates of change. An increase of 0.06 Sv for a few hundred years achieved shutdown of NADW formation in modelling by Rahmstorf (1995a). A larger flux of 0.16 Sv directly inserted into the North Atlantic for just 4yr could achieve a similar change (Rahmstorf, 1995b). 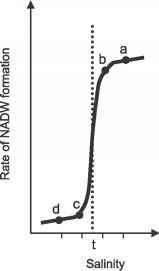 Figure 28.9 Curve illustrating the response of North Atlantic Deep Water (NADW) formation to the introduction of an arbitrary volume unit of freshwater that reduces surface salinity at a time when there is a specific 'Rate of NADW formation' (after Stocker, 1996; Bond et al., 1999). For example, if salinity was reduced by 1 unit on the 'Salinity' scale, when NADW formation was high (point a), there would have been only a small response in NADW formation rate (point b). This situation is like the present interglacial mode, which is relatively insensitive to freshwater additions. If salinity was reduced by 1 unit when NADW formation was low and salinity was also relatively low (point c), as probably occurred during a full glacial, there would only be a small response in the rate of NADW formation (point d). In contrast, if freshwater additions reduced the salinity by 1 unit when salinity was near the threshold value t at point b, it would reduce the rate of NADW formation dramatically to point c. This probably is what the North Atlantic Ocean was like during the transition from glacial to interglacial conditions, and may have led to the large change in NADW formation associated with the Younger Dryas that is attributed to the 9500 km3 outburst from Lake Agassiz. (Rind et al., 2001a). Teller et al. (2002) conclude that large draw-down events of Lake Agassiz would likely have triggered a change in THC, especially when the influx occurred under weakened THC conditions during the glacial-interglacial transition, and when it was followed by a diversion and increase in baseline freshwater inflow. The subsequent Preboreal Oscillation (PBO) at 9.6ka (10,900 cal.yr) and the climatic event called the 8.2cal.yr cold event, which are registered in Greenland ice cores and terrestrial records in Europe, are also attributed to diversions and outburst floods of freshwater from the North American continent. The PBO, known from vegetation shifts in Europe and eastern North America, has been linked to the opening of the northwestern outlet of Lake Agassiz around 9.9ka (11,300cal.yr) (Fisher et al., 2002; Teller et al., 2002). Fisher et al. (2002) suggest that the diversion of runoff and lake outburst floods down the Mackenzie Valley to the Arctic Ocean may have induced sea-ice thickening there and greater outflow of sea ice and freshwater into the North Atlantic Ocean, inhibiting THC. Additional freshwater contributions to the North Atlantic about this time came from draining of the Baltic Ice Lake in Europe (Bjorck et al., 1996; Hald & Hagen, 1998). The relatively short duration (about 200yr) and limited impact of the PBO may be a consequence of Agassiz outflow to the Arctic Ocean (versus the North Atlantic Ocean), a more robust phase of THC, and a lack of previous preconditioning freshwater outflow to the Gulf of Mexico (Teller et al., 2002). The 8200cal.yr cold event (Alley & Agustsdottir, 2005) lasted only 100 or 200 yr, and is manifested in vegetative, limnological and speleothem proxy records in Europe (Klitgaard-Kristensen et al., 1998; von Grafenstein et al., 1998; Tinner & Lotter, 2001; Baldini et al., 2002), depressions of air temperature over Greenland (Alley et al., 1997), and by increased wind speed in the Atlantic tropics due to high-latitude cooling (Hughen et al., 1996). This event is attributed to THC slowdown related to the enormous final discharge of merged glacial lakes Ojibway and Agassiz (Fig. 28.3e; 5.2Sv for one flood or 3.6 and 1.6Sv for two closely spaced drainages). This drainage is associated with the collapse of the LIS about 8400 cal. yr and the onset of Hudson Bay watershed runoff to the North Atlantic via Hudson Strait (Barber et al., 1999; Clarke et al., 2003, 2004). Teller et al. (2002) suggest that the relatively small THC impact of this huge influx, which preceded the 8200cal.yr cooling by several hundred years, can be explained by the fact that the North Atlantic Ocean was in a more stable mode of circulation (Fig. 28.9). Dean et al. (2002) offer the view that the 8.2 ka cold event resulted from a reorganization of atmospheric circulation related to marked changes in the proportion of land, lake and glacial ice in North America at this time, the most important of which was the drainage of Lake Agassiz and disappearance of the central LIS over Hudson Bay. These changes, they argue, may have produced a perturbation in climate over Greenland that resulted in the brief cold pulse detected in ice cores and elsewhere.